This new book by Master Trainer Arnie Skelton is intended for anyone starting on their NLP learning path, who initially might find the technical language of NLP difficult to access. This book provides its user with a comprehensive explanation of over 150 key NLP terms, using everyday language, and practical examples. 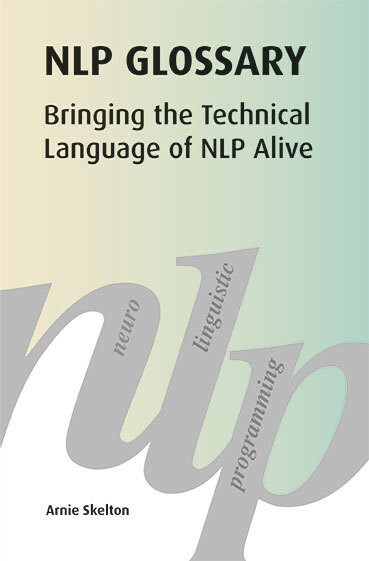 The book can be used in a number of ways: firstly, as a comprehensive introduction to the key terms and concepts of NLP. It can be read as a conventional book, cover to cover, to introduce to the reader all the concepts they will ever need to understand key NLP terms. Alternatively, the book can be used as a reference guide, to support any NLP learner who might want to look up or check their understanding of any key terms. The book will be a very useful addition to any library or learning resource. The book will also be available in electronic form, so it could easily be downloaded onto kindle or other electronic devices. The book is organised alphabetically, with a clear explanation, working example and (often) a story to show how the term works in real life.